Designed with the business questions of cultivators in mind, this FREE cultivation report includes all-new and insightful data about fluctuating wholesale cannabis prices in recreational and MMJ markets across the U.S.
Information included in this Cultivation Snapshot: U.S. Wholesale Marijuana Prices and Supply has been exclusively curated by researchers and editors at MJBizDaily and is the first of its kind regarding cannabis cultivation. No other agency tracks the fluctuating cost and supply of wholesale cannabis, but as the cannabis industry continues to expand nationwide, the need for in-depth trend analyses has become crucial. Editors and researchers of MJBizDaily surveyed dozens of growers and retailers across every recreational state and compiled the exclusive findings into useful trends in supply, price and market outlook. In addition to state-by-state breakdowns, this report offers insight to national wholesale trends. Trusted by cannabis experts, media groups, cultivators and professionals around the world, MJBizDaily provides the first and most accurate resource for sales information, market trends and data analysis related to cultivation. 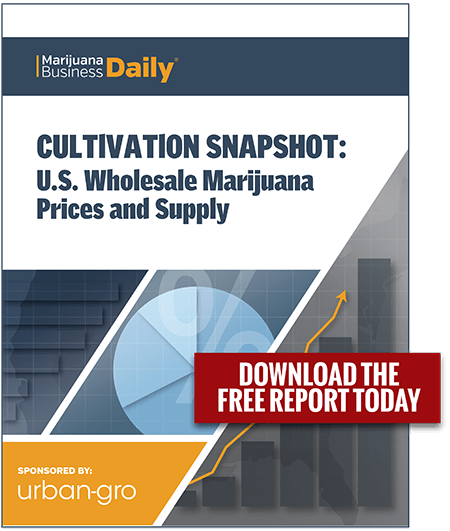 The Cultivation Snapshot: U.S. Wholesale Marijuana Prices and Supply report is available to download for a limited time as a complimentary product to MJBizDaily subscribers. Fill out the form below to download your free report! S Georgia & S Sand. Is.